SANTA FE – The New Mexico Department of Game and Fish is seeking qualified men and women to join the next generation of conservation officers who protect and conserve the state’s natural resources. Applications for game warden trainees with salaries starting at $17.03 an hour will be accepted by the New Mexico State Personnel Office until June 5, 2016. Please visit www.wildlife.state.nm.us to learn more about the position and how to apply. Prior law enforcement experience is not required, but successful applicants must possess a bachelor’s degree in a related field such as fisheries or wildlife biology, forestry or criminal justice. Please visit www.wildlife.state.nm.us for a complete list of qualifying degrees. Candidates also must pass psychological and medical exams, a background investigation and fitness and drug tests. Applicants also must pass a written exam and an oral interview board before being offered a position. If hired, recruits will receive basic training at the state Law Enforcement Academy and the department’s recruit school before undergoing a year of on-the-job training under a field training officer. Those hired can look forward to extensive training in subjects such as emergency vehicle operations, criminal investigations, defensive tactics, firearms training and arrest procedures. Training also includes aerial wildlife survey techniques, wildlife restraint, off-highway vehicle and boat training. Training is rigorous and the work is often difficult, requiring sound judgement, a good work ethic and common sense. The department is seeking highly motivated personnel who are up to the challenge this career offers. 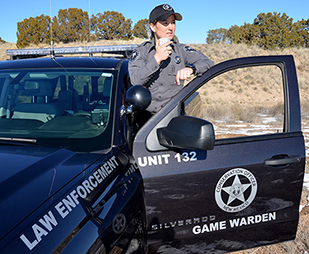 Conservation officers primarily work alone in remote, rural regions of the state while enforcing New Mexico’s game and fish laws, investigating criminal cases and pursuing civil cases against offenders. Officers also educate the public about wildlife and wildlife management, conduct wildlife surveys, capture problem animals, investigate wildlife damage to crops and property, assist in wildlife relocations, and help develop new hunting, fishing and trapping regulations. For more information about conservation officer duties, educational and physical requirements, training and employee benefits, please visit www.wildlife.state.nm.us/enforcement/career-advancement or contact Lt. Brady Griffith, the department’s recruiting officer at (505) 795-1700 or bradyd.griffith@state.nm.us.